"This picturesque loyalist pupil of Dr. James Lloyd, of Boston, was born in that town, February 5, 1745, graduated at Harvard in 1763 and studied abroad, where he received an M.D. at Aberdeen in 1769. Educated under Hunter, Smellie and Warner, Broussais considered him the leader of medical opinion in America, according to O. W. Holmes. In 1771 Admiral Montague, commander in chief of the British North American Squadron, appointed Jeffries assistant surgeon of a ship of the line, with a hospital on shore, a position he held until 1774. His British sympathies held true during the Revolution. It was he who identified the body of Joseph Warren, his intimate friend, to General Howe after the battle of Bunker Hill. After the evacuation of Boston he accompanied the British to Halifax and eventually was appointed surgeon-major to the forces in America, settling in England at the close of the war. In 1784 he made the first balloon voyage over London, dropping cards of greeting to admiring friends below. This ascent was made for scientific study of the air at high levels, and not solely for spectacular purposes. Jeffries carried with him a reliable barometer, a thermometer of special make, a hygrometer, an electrometer, a mariner's compass, and seven small bottles for obtaining samples of air at different heights. He reached an elevation certainly exceeding 6560 feet; and his observations were turned over to the Royal Society to be discussed; and they were analyzed by no less a chemist than Cavendish. On January 7, 1785, about five weeks after the London ascent, Jeffries crossed the English Channel, leaving the cliffs of Dover and landing with his aeronaut in the forest of Guines, in Artois, near the Field of the Cloth of Gold. Jeffries was a keen meteorologist, one whose interest did not flag with advancing years. He kept detailed records of the weather in Boston from 1774 until March 4, 1776, when they were evidently interrupted by the war, and again from 1790 until 1816. These [were] in the library of the Blue Hill Meteorological Observatory and are greatly prized as authentic climatic data. The year 1790 marked the return of Jeffries to Boston, when he practiced surgery, medicine and midwifery until near the time of his death, September 16, 1819, from strangulated hernia. James Thacher says that he delivered the first public lecture in anatomy in Boston and that on the second evening a mob collected and carried off his subject, the body of a convict. His love of anatomy continued through his life. At his death he had one of the most valuable private libraries in the country. He published a "Narrative of Two Aerial Voyages," London, 1786. His methodical habits are attested by the diary he kept for more than forty years, recording all his important cases in medicine and surgery and nearly two thousand cases of midwifery he had attended; this besides making three entries a day in his meteorological journal. His son, John Jeffries (1796-1876), made a specialty of ophthalmic surgery and helped found the Massachusetts Charitable Eye and Ear Infirmary in Boston in 1824. 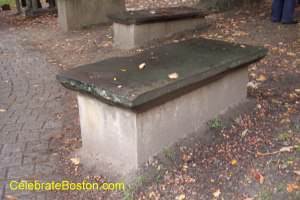 Jeffries was buried at Granary Burying Ground, on Tremont Street in Boston, Tomb 175. It is located in the left rear of the cemetery. Walk straight ahead to Paul Revere's marker, then turn left. The tomb is on the right and its surface is well-worn.